Picture this. You are on a plane, 35,000 feet in the air. You have hours to go before you reach your destination. Passengers are giving you dirty looks. Your patience is wearing thin and you worry you might lose your mind (and your temper) before your flight is over. The cause? Your squirmy kid. What’s a traveling parent to do? Zip ties? Just kidding, although my husband and I have discussed this option more than once. Doesn’t she look calm, sweet and innocent? I am writing this post because I am the mom childless adults fear. The mom of the very loud, very active, and very impatient child. 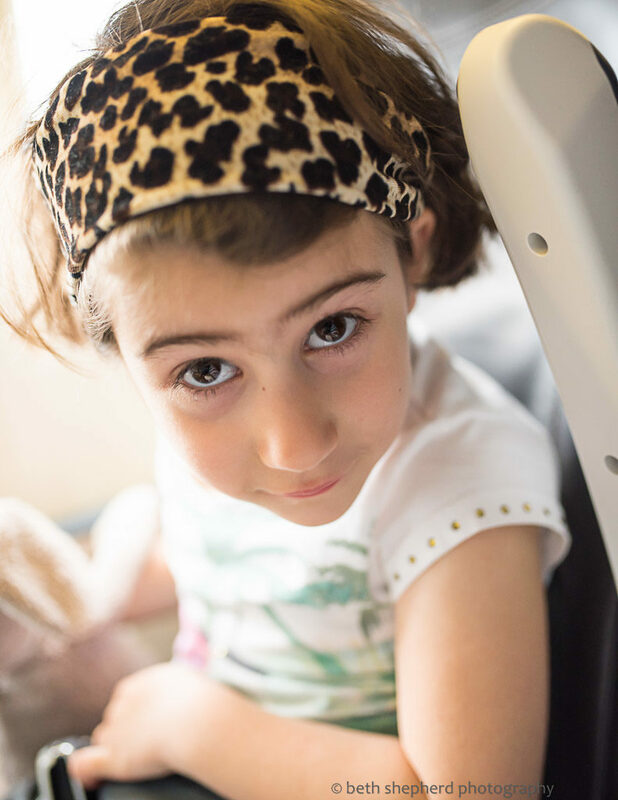 The child who, I might add, never naps on a plane (okay, once, when we adopted her and returned from Armenia). One of the worst scenarios I can imagine is putting this child in an enclosed metal tube, holding her hostage in an uncomfortable seat, restricted by an equally uncomfortable seat belt. For hours. Just thinking about this makes me want to give up traveling, which is unfortunate because I love to travel. Attempting to climb over the seat. As a kid-free traveler for many years, I completely understand–sympathetic as one may want to be–how frustrating it is to have your seat kicked every ten seconds or find yourself in the row beside a screaming child. Now that we are parents, no matter how much I tell myself people ‘get it’–or at least those with kids get it–I still feel hyper-aware each time my daughter stands up and looks over the seat or screams for any extended period of time. There have been flights, more than one, where my husband has held her in a tight embrace as she kicked and hollered at the top of her lungs. Not much fun for anyone, including us. Not child torture. Just having fun in the galley where we’ve spent lots of time. 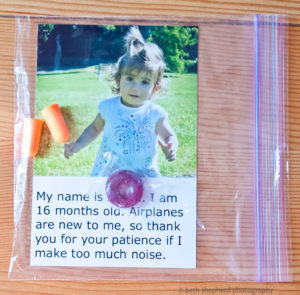 On one of our trips, when our daughter was a toddler, we filled Ziplock bags with a lifesaver, earplugs and a photo of our daughter that read: I am 16 months old. Airplanes are new to me, so thank you for your patience if I make too much noise. We passed these bags out to the people in the rows beside, behind, and in front of us. People laughed and I felt like our gesture let us off the hook for anything that might follow during our flight! 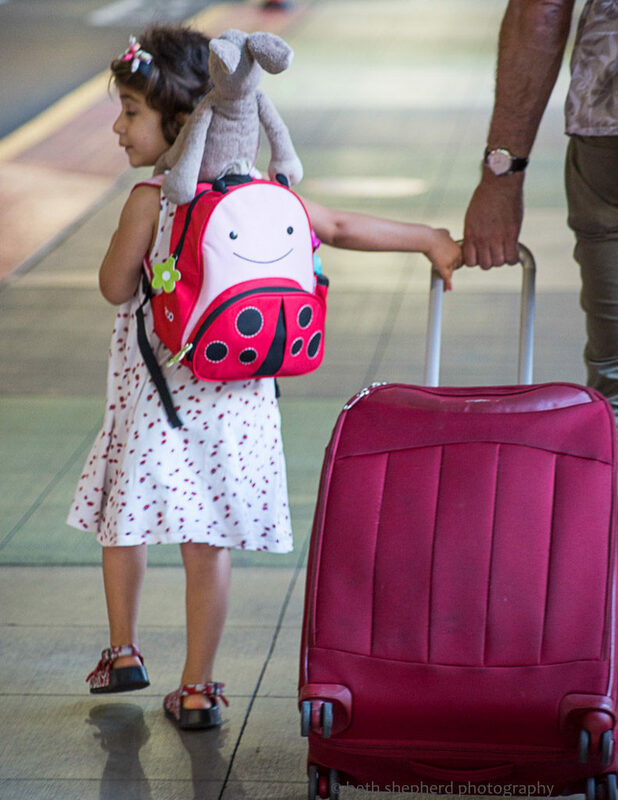 Inside that cute ladybug backpack? Ammo enough (we hope) for one flight’s worth of fun. Right before our trip, I smuggle my daughter’s special travel backpack out of her closet and fill it with novel toys and games: new stickers, lacing cards, paper and crayons, a small puzzle, and magnet play boards like Magnetic Whiskers . Melissa & Doug On The Go Water Wow are also fun, “paint” without the fuss and muss, small and packable. I do not let her see anything in her backpack until our plane is off the ground and at cruising altitude. The curiosity and anticipation is sometimes enough to hold her through the first 30 minutes. I cross my fingers and hope the goodies inside will keep her busy for the rest of the flight, if we’re lucky and if we dole them out slowly. You can get all sorts of cool geegaws and gadgets on Amazon.com, and Safeway, Walgreens, Bartell or The Dollar Store are all great places for toys on the cheap. Note: If you let older kids pack their own backpacks it’s smart to see what’s going in there. Say ‘Hi’…whether you want to or not! Make sure to bring your Kindle Fire, like the Fire Kids Edition Tablet . Load it with videos and games, preferably some they haven’t seen before or that are generally off-limits in your home except for special occasions. Like taking trips. We have worked the “You can watch Frozen !” angle on more than one occasion. Don’t have a portable device like the Kindle or a DVD player? Buy one. Now. Videos should be accompanied by headphones, not earbuds which can easily fall out and might not cancel background noise for the kid and video noise for passengers sitting nearby. I have been on airplanes where I was subjected to more Teenage Mutant Ninja Turtles audio in a few hours than I’d heard in a lifetime. Cowabunga, dude. One risk is that some kids, such as ours, will then talk very loudly, yell even, because their headphones make them unaware of the volume of their voice. What gourmet dining looks like when you’re two. There’s not a kid alive who isn’t wooed by a good snack, especially it’s a treat they only get on special occasions. Of course the caveat is that some kids, like ours, get pretty worked up from high-sugar snacks so this trick can backfire if you’re not careful. Plus, chocolate melts and little hands are in close quarters with a myriad of things that can easily be stained. Animal crackers, popcorn, and potato chips are a few that take awhile to get through. Having to reach inside the bag or box, eat and repeat extends the fun. Now is not the time to be concerned about nutrition and of course, and you can always supplement with apple slices, cheese cubes and raisins. Of course, a lollypop is never a bad idea, particularly during take-off and landing when sucking and swallowing can help open little ear canals. One last bit of advice. Plan your flight in 15-minute slots. 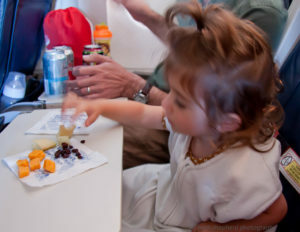 For a three-hours in the air you need around ten activities to keep little ones with short attention spans entertained. Take-off and landing are typically the “stars of the show,” which gives you a 15-minute reprieve on the front and back ends of your journey. We spent a lot of time on one flight discussing the wheel well while waiting for the plane’s wheels to descend! 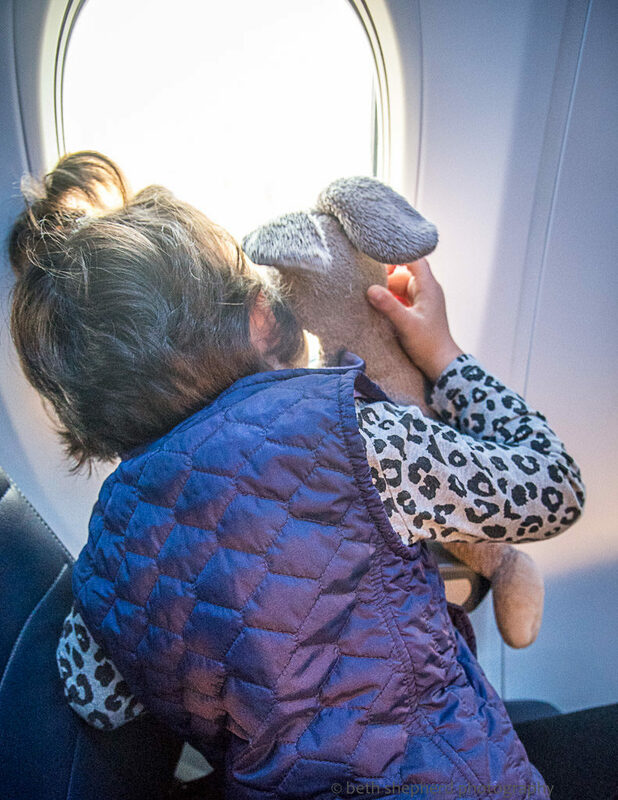 Happy travels to all the moms and dads out there–and GOOD LUCK! *Disclaimer: I did say “try.” Which doesn’t always mean we were successful.